The UKs number 1 company for proof of income. We guarantee a friendly, professional and confidential service. 20 years in payroll services. 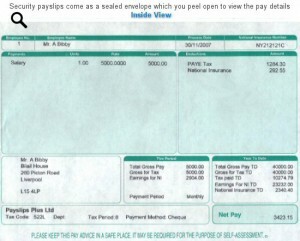 These payslips are printed on a dot matrix printer of the highest quality and will show all the necessary pay and deductions, company name, your name, your address and national insurance number. Complete your details for this payslip below. Each additional payslip is £7.00. Minimum quantity for this payslip is: 1. Maximum quantity for this payslip is: 52. What is my 'NI Number'? Your NI number is your National Insurance Number. It will be in the format of two letters followed by 6 numbers and a single letter at the end. If you select monthly payslips please enter the date of the first and last month you wish to be paid. i.e. If you want 3 montly payslips for 30 June 07, 31 July 07 and 31st August 07 then enter dates of 30th June 07 and 31st August 07. If you select weekly payslips please enter the date of the first and last week you wish to be paid. i.e. 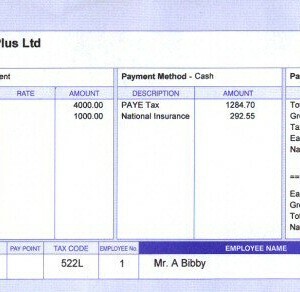 If you want 3 weekly payslips for 8th June 07, 15th June 07 and 22nd June 07 then enter 8th June 07 and 22nd June 07. A common weekly pay day is Friday. Your Annual Salary is the total amount you are paid for the entire year. Is your pay before any deductions (i.e. Tax and National Insurance) have been taken into consideration. Is after deductions i.e. your take home pay. If you require any additional extras then please tick the appropriate boxes below. You may select more than one. There will be a £4.95 charge for each additional extra. If you do not select an Employee Number then a default number will be given. For any additional extras selected, you must provide details within the Additional Information field below. If you do not provide details of the required information, it can lead to delays in processing your order. Use this box to provide any additional information about your order or if you have selected any extras then please give an explanation in the Additional Information section above. For payments and deductions enter how much and how often. Category: Plus Security Payslips with Employee Address. If you want to pay by cash click here for details. Bonuses, Overtime, Pension, Department, Commission. You can take advantage of this facility by filling in the extra information section on the order page. Employee and Employer's details can be entered at checkout.